ChutingStar Gear Bag & FREE US Shipping! Automatic 20% Off + FREE US Shipping! Top Gun Camera/Smoke Ankle Bracket for skydivers. The ChutingStar-Skydive long-sleeve T-shirt. This is our latest design featuring the original ChutingStar logo on the front and the ChutingStar-Skydive swooper down the right sleeve. Available in black only. Gildan 6.1 ounce ultra cotton t-shirt, pre-shrunk, 100% cotton. Available in sizes Small to XXLarge. Custom UPT Vector 3 container. United Parachute Technologies is the king of the skydiving industry. The company is known for the 3-ring system, tandem skydiving, magnets, spectra reserve ripcord and the Skyhook. New options on the Vector3 include spacerfoam, magnetic riser covers and the Louie Loop for the front risers. Flex Z Goggles are a comfortable, flexible, long-lasting set of eyewear. This is a perfect pair of goggles for all types of skydiving. Flex Z Goggles are available in Original, Mini, Ultra Mini and Over-The-Glasses sizes. 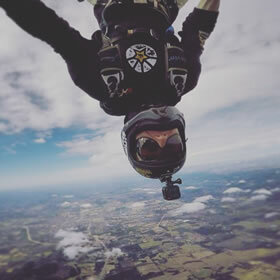 The Cookie G3 Skydiving Helmet is the must-have full-face helmet for skydivers and wind tunnel flyers alike manufactured by Cookie Composites Helmets.